In testimony pre-filed today with the Public Service Commission, a former utility regulator and utility executive criticized Wisconsin Public Service Corporation’s proposed restructuring of electric rates and service charges. Targeting residential and small commercial customers, WPS seeks to sharply increase their base service charges and lower their variable energy rates. For residential customers, the fixed monthly fee would rise from $10.40 to $25. For small commercial customers, the fixed monthly fee would climb from $12.50 to $35. The energy rate would decline between 10% and 13%. 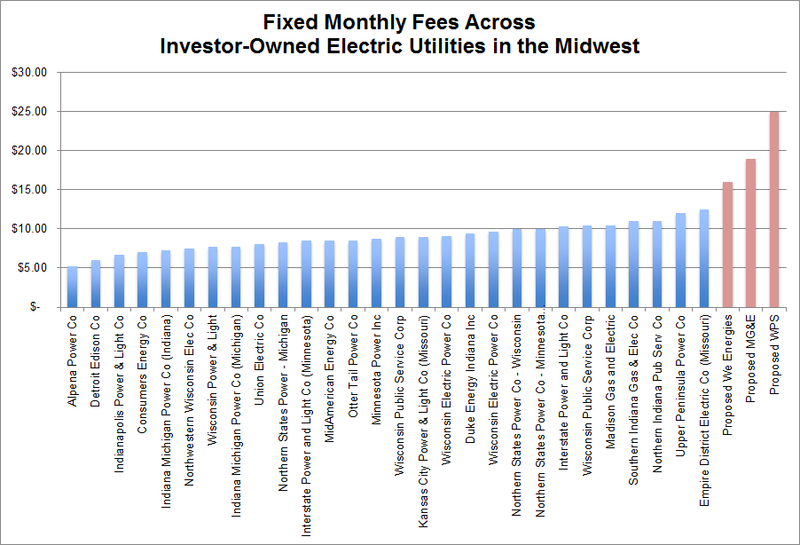 If approved, the fixed fee hikes sought by WPS would be the highest allowed for a regulated electric utility in the Midwest. “The increase is so steep as to be literally off the charts,” said Huebner. 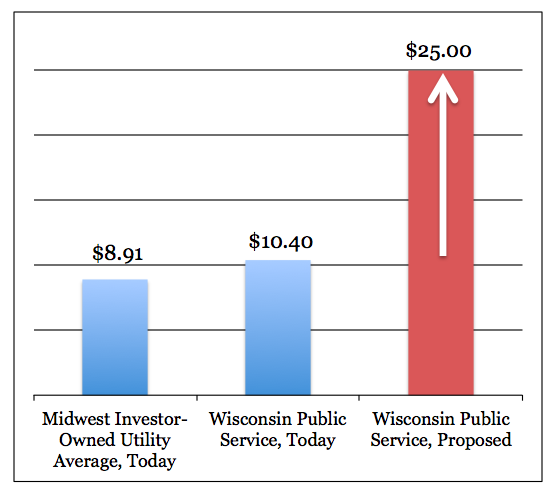 Monthly fixed fees for residential customers of Wisconsin Public Service Corporation, as of today and proposed for 2015, compared to similar Midwestern utilities. “This new billing scheme would exact a financial penalty on customers who invested their savings in clean energy systems that yield benefits to all WPS customers. A lower energy rate creates a longer payback period for solar. It would dramatically lower interest in solar self-generation by residential and small commercial customers in 2015 and beyond. It could very well slam the door on solar for WPS’s customers,” concluded Huebner. The restructuring proposal surfaced this spring as part of the Green Bay utility’s request for an overall 8% increase in electric revenues over the next two years. The rate proposal is under review by the Public Service Commission. We Energies and Madison Gas & Electric have proposed similar changes, which would put their fixed monthly fees at 80% and 113% above the Midwest average of $8.91, while WPS’ proposal would put it 181% above that average (see below). The testimony of Karl Rábago and RENEW Wisconsin can be found here by searching for docket number 6690-UR-123. Graphic courtesy of the Environmental Law & Policy Center. Data for both graphics comes from OpenEI.org, an open-source data-sharing platform supported by the National Renewable Energy Laboratory, and the U.S. Energy Information Administration at eia.gov. The dataset included monthly fixed charges besides the "customer charge," such as a monthly distribution charge that is labeled separately on the bill, to report the total monthly fixed rate. RENEW Wisconsin is an independent, nonprofit 501(c)(3) organization that leads and accelerates the transformation to Wisconsin's renewable energy future through advocacy, education, and collaboration.